Pt 2 – Concert memories are here . Links to all interviews and reviews are here. Take a breath. Start with this. 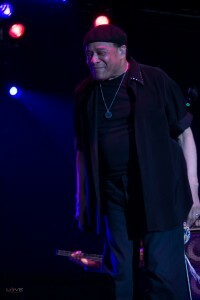 If it wasn’t for Al Jarreau you wouldn’t be reading this because I wouldn’t be writing it here.. It’s that simple. On a summer evening after a show I told him that a group of us were starting an online magazine that would focus on music in depth, do some editorials that just might be controversial, and play with some humor too. He said “you must do this.” I asked if he would be willing to do an interview after we were established and he said “Why wait? Let’s do it soon.” A week or so later I’m on the phone with Al Jarreau. Several times. Between these conversations hurricanes would pass through Florida, the power would go out and the humidity would go up. I sat on the floor surrounded by candles with a battery operated recorder hooked to the phone picking up all the insightful things he said while my neighbor’s generator whirred and mosquitoes buzzed in the background. I ended up holding a five hour treasure box of conversation that had to be made linear and shared with the world. I was a radio girl, I could edit sound in my sleep but I had never done a print interview before. The process was as hard as the content was beautiful. He had just released a musical milestone, the jazzy Accentuate The Positive. I had been playing it continually for most of the summer. It was material to handle with care. It took time, it was scary, it got done. It was the first of many interviews, editorials, humor pieces and reviews that I would write. Others on the staff, some with little or no experience in the beginning, would do the same and they would bloom. At a time when indie media was still considered irrelevant we were able to establish ourselves, which opened the door for others to jump in too. This is what Al Jarreau did. He would see the spark in someone and start fanning the flame before they even knew they had the spark to begin with. Affirmation of this is all over social media in stories shared by people from all walks of life. He mentored, supported, encouraged, and even more significantly he pushed himself and others outside the box, outside the safety zone, and beyond any limitation. I was a lucky one. I was the Music Director at several fairly high profile radio stations in the 80s and early 90s when record companies had money to spare. That meant you got concert tickets and backstage passes, and often your travel expenses were covered. 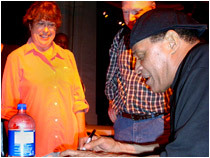 Over the years I ended up going to over 40 Jarreau concerts. It became this one consistent beacon in a constant sea of change. Jobs, relationships, friendships, locales, even entire careers might shift relentlessly but there was always a Jarreau concert somewhere in the future: a chance to get back to the garden, dive into the music and the conversation between the songs, and fuel up for the next round of whatever was going to get thrown my way. After the shows I would watch him make such beautiful connections with everyone from awe-struck fans to long time friends. When he talked to anyone, everyone, he made them feel like they were the center of the universe – that they mattered to him and had his full attention. It might be late, he might have just been giving his all on stage for hours, there might be dozens of people waiting to meet him but he always gave his all to each of them for at least a brief moment. A moment they would treasure and remember for a lifetime. He didn’t need to be present to create those moments, though. People bonded with his songs on a level far beyond a given song just being a favorite. They touched people on a deeper level. I was able to pick my own music on my Sunday jazz brunch shows, so even when the big corporate stations were down to just “Mornin’” and “We’re In This Love Together” I could dig as deep into any album as I wanted to and play the songs I knew listeners would love. Jarreau songs always lit up the phones. People didn’t just want the title of the song or the name of the album it was on. They wanted to share stories of how the lyric touched them at exactly the time when they needed to hear it and cheered them up or gave them a different perspective on something they were going through. For a while I always opened the show with “Heart’s Horizon.” I still have a postcard from a listener who said she took her horses out at 8am and every Sunday when that song came on they started dancing in the field. Me, I was a sitting duck. I was the jaded smartass smart chick fusion baby who had little to do with anything poetic or romantic and less to do with anything spiritual. Then I stumbled into this album with a green cover in the new release bin at our college radio station, put it on and froze in my tracks. A few years later I “accidentally” ran into someone from his record company who took me backstage to meet him. So that’s how God shakes your tree. If music is the only way to shred cynical, snarky and downright misanthropic inclinations, she finds you a favorite who is gonna remind you that we are all connected, we are here to take care of each other, and there is something bigger than us at play always. 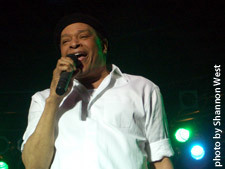 Al Jarreau has moved on. We hold his family and those who were close to him in our prayers. And yes, there is this sense that because their loss is so big our grief should be smaller. There are so many comments from fans around the world who are still processing, still finding themselves near tears at odd moments and either listening only to his music or unable to even think about listening to anything because they feel such a tender loss. All the while some are asking if they should feel so deeply the loss of someone they had may only have heard through a speaker or seen on a distant stage and never even met? It matters. His music touched you. His energy, the insights he shared both in song and in interviews touched you. Give yourself the space to feel this loss, allow yourself to be sad, to miss him as you would anyone you care deeply about. You matter because the music he created means so much to you. It probably soundtracked some part of your life: the song you danced to at your wedding, or played to your child before she was born. The album that consoled you when there was an ending in your life or the song that encouraged you to find that next new beginning. So play it, share it, he lives on in these songs. And you…you are one star that is part of a constellation full of others who feel the same way and we are all shining bright and covering this sometimes heartbreaking space with a radiant Glow. 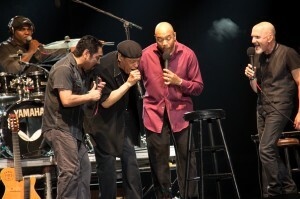 ACapella with the band: Mark Simmons, John Calderon, Chris Walker, Joe Turano. A steamy night in Atlanta I think? So you, shining stars, are now keepers of the flame. 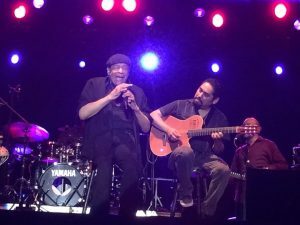 Jarreau often talked on stage and in interviews about how important it was for people to do the things that bring them joy, the creative things they may have abandoned as the responsibilities of “adulting” overwhelmed their lives. Carve out some time to find that thing you love and do it. It may be arts related, it may not. Whether it’s painting a canvas or painting a house you celebrate life when you get in your zone and let it flow. Encourage others to do the same thing. Pick up the thing you left behind because you didn’t pass the audition or make a good grade way back when. Encourage young people to not get discouraged if that happens to them. And support the arts! Let your local, state and national representatives know that you support the funding of arts related organizations and arts education. Think locally too. Support your hometown theatre groups, local musicians and bands, orchestras, art museums, writers, bookstores..everything! Volunteer and donate if you can. And please support live music. Buy concert tickets, downloads/CDs, show up and give the people on stage some love. Discover new music and new artists then tell all your friends about them. There is so much beauty in the world and more just waiting to be created by you. And now for the fun stuff. Hit this link to see this writer/fan’s most memorable Jarreauniac moments. Read mine then share yours in the comments. Let’s fill this page up!